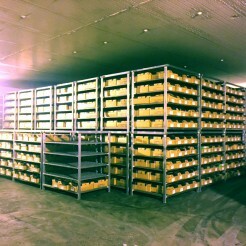 Austco Polar Cold Storage is a high capacity freezing plant with assorted sizes of blast freezers. Our blast freezing setup allows our staff to manage loads in diverse ways allowing for the most efficient use of our facilities as possible. 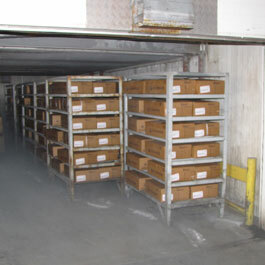 We blast freeze in the vicinity of 8000 units per day of meat. The addition of four blast freezers in 2015 increased our blast freezing capacity to keep our customers satisfied and maintain the throughput and turnover of product efficiently. Our blast freezers and refrigeration program is monitored 24 hours a day and continue to have an exceptional uptime history. We are actively maintaining our equipment and are always looking at more energy efficient and environmentally friendly ways to improve. We have implemented a Glycol system on our site to increase efficiency in the blast freezing process. We believe that the key to our business is our staff and we place high expectations on our professionalism and having our staff well trained in manual handling and quality control procedures for food handling products.